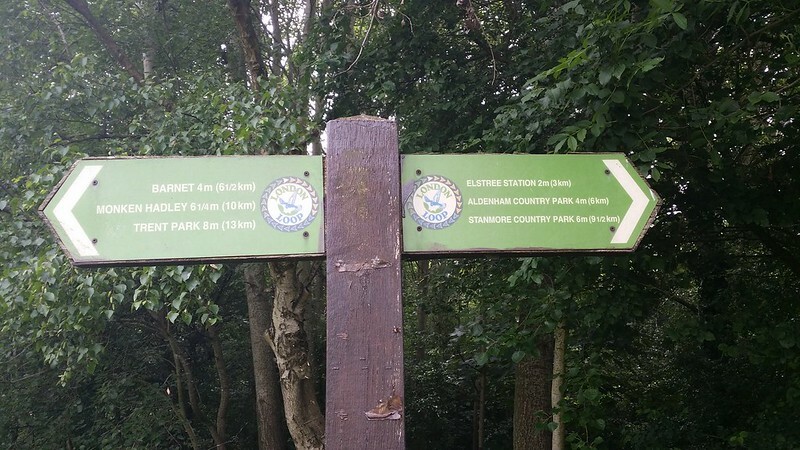 I stepped out of Cockfosters station and crossed the road to pick up the London Loop signs. 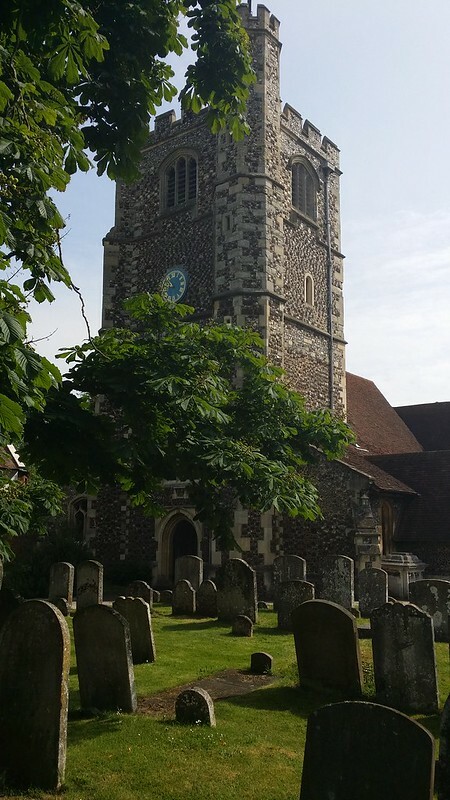 A short walk past a church and along the edge of a residential area brought me to the start of Monken Hadley Common – a strip of woodland lying athwart the East Coast Main Line out of Kings Cross. I followed the woodside track hearing the distant whirr of trains and birds greeting each other as they clocked on for their day’s work. A lone worker came from the other direction, herself seeking to escape the mundanity of the urban for a few minutes on her way to work. 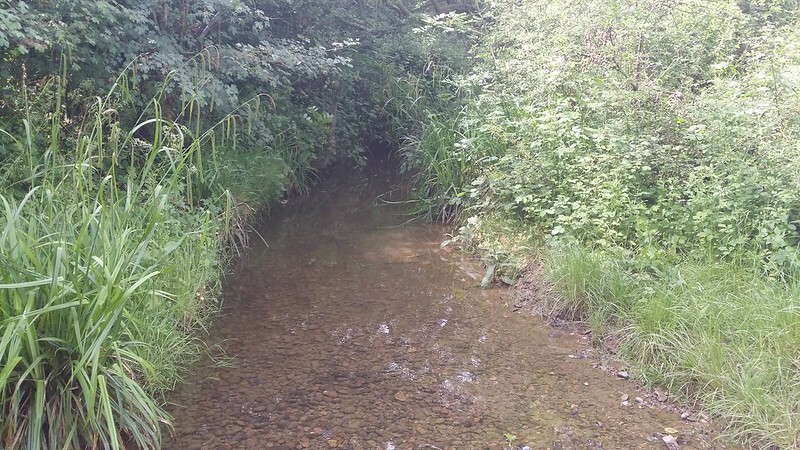 A lone fisherman crossed my path and disappeared deeper into the wood as I reached Pymme’s Brook. A chaffinch flew cheekily in front of me and was swallowed by the branches overhead, while bits of discarded foliage rained down on me from the unseen antics of the local squirrels. I arrived at the source of the electric noises, and stood for a few moments on the centre of the bridge as a train thundered towards central London beneath me. Soon the path ran right alongside a road, and then teasingly snaking first close and then further away, while the sounds of others’ working days – dustcarts, vans racing and the odd lawnmower – floated through the tress . I grabbed branches to steady myself where the path was all churned up mud, and received a shower of moisture from the wet foliage above. But it was still better than the road and its attendant bustle and noise. Sadly, the trees and path ran out, and I found myself walking along the road anyway, until open common beckoned. Now it was time for a brief detour from the route of the London Loop, as just the other side of the common lay the summit of the London Borough of Enfield on its border with Barnet. 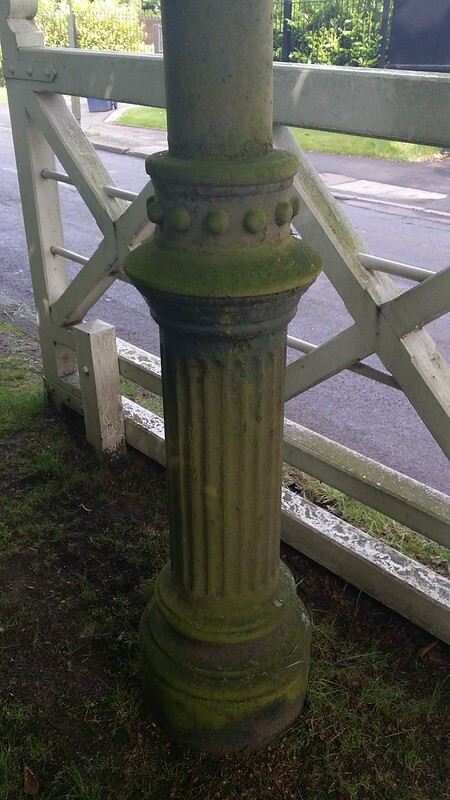 A bit of hunting around and I found the boundary pillar tucked behind the gates marking the border crossing. Retracing my steps back to the Loop, I walked along the road into the village of Monken Hadley, and stepped back in time. Much more rustic looking than you would typically expect in London, and as I made my way through the village and across Hadley Green, the history of the place hit me in a number of separate ambushes. 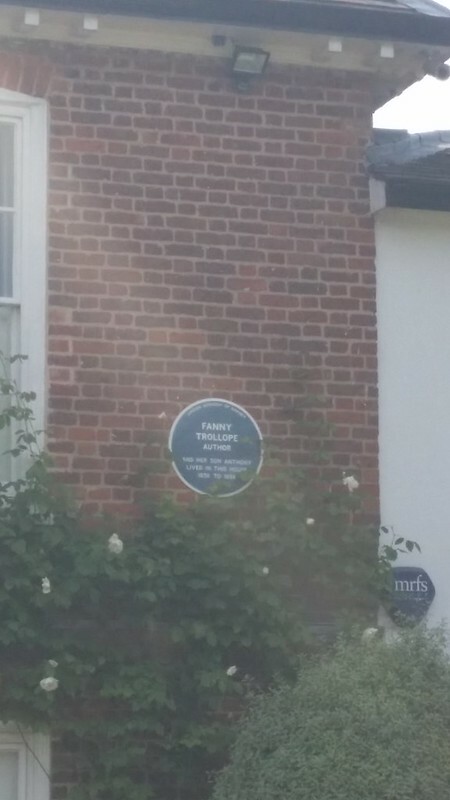 First up, I spotted a blue plaque on a house on my left, and closer inspection revealed it to be the home of Fanny Trollope and her better known son Anthony. A sign on the green then informed me that Dr Livingstone (as in “…I presume”) also came from round here. But the big one was still to come. No marking on a map like later and better known battlefields, but as I stood at the edge of the green reading about the history of this place, I discovered that this was the site of the Battle of Barnet in 1471. A fan of medieval history, I was fascinated to find myself on the spot athwart the (old) Great North Road where Edward IV finally put to an end the scheming of Warwick the Kingmaker after he defected to the previously deposed Henry VI the year before. 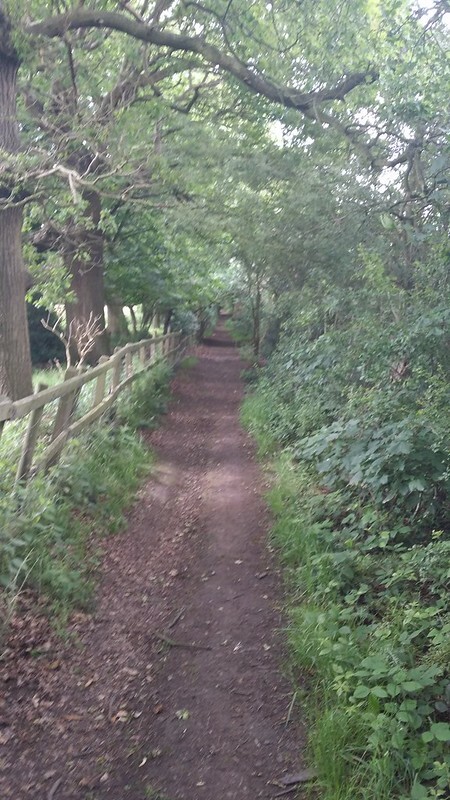 Barnet hill is also said to be the hill in the nursery rhyme “The Grand Old Duke of York”. Reluctantly, I stepped away from the battlefield into a lush downward sweeping swathe of greenery (probably well-nourished by the fallen from the battle). A whole kilometre long, it took me all the way to High Barnet and was all the more welcome as there was no suggestion of it on the map. A brief dalliance with the A1000 and then the Loop deposited me in a park that morphed into the Dollis Valley Green Walk and I strolled through humdrum urban fields for a while. 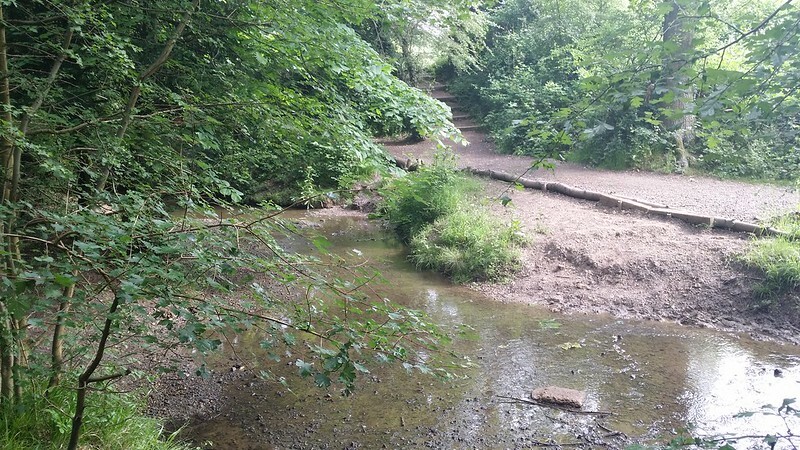 The path crossed the Dollis Brook a few times, and out of curiosity I dipped down to the brook itself and stood amidst the teeming maelstrom. The early start was beginning to tell now, and flagging noticeably, I crossed the brook again, wondering just how much more of the relatively unexciting Valley Walk I could endure. 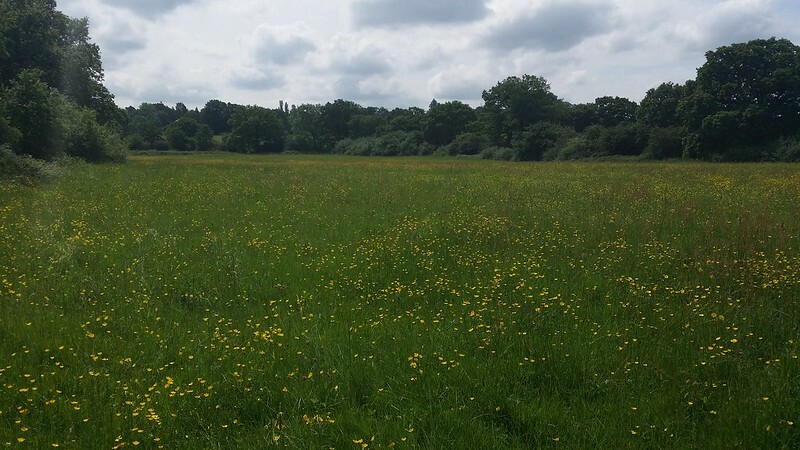 But on the other side, I found myself in a field of buttercups, the swathe of yellow only spoiled by a line of telephone poles cutting right through the middle. This didn’t matter as a further 5 fields of buttercups were to follow, and I felt spirits rising accordingly. 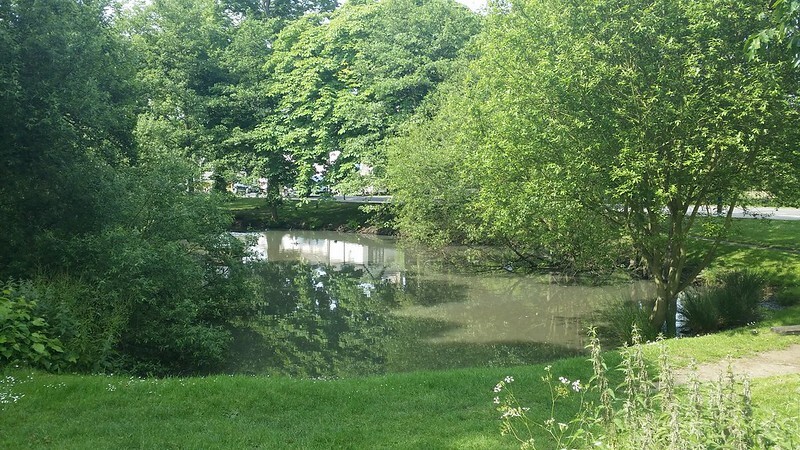 Constrained into a path between a fence and the brook, I found it all churned up mud and repeated my tentative swinging from tree to tree from earlier. But I couldn’t avoid the mire and my shoes having been nicely cleaned up by walking on wet grass for much of the last hour, were now surmounted by a muddy casing and the work was undone. I spied a handy fallen tree which appeared to be optimally configured for a lunch perch and took a break. After lunch I soon found myself on a short stretch of road that curved around the edge of Mote End Farm, but decided not to bother attempting the bagging of another London Borough top which was situated somewhere on the premises – clearly near to the farmhouse itself. An easy wooded path took me down to Moat Mount and the raucous disturbance of the new Great North Road in the form of the A1, crossing which involved a significant detour along the road to a subway. The illusion of walking on the edge of things and out of sight of the mainstream was instantly shattered. With relief I stepped off the A1 into a wilder landscape. forgin an indistinct path through long grass until it became wood. A lack of waymarking had the potential for trouble here, and I used the common navigational technique of pure guesswork when faced with a choice of paths. I seemed to strike it lucky though as the waymarks reappeared after all of the confusing paths were done with, and I stepped forward with more confidence, if not energy which was rapidly waning. 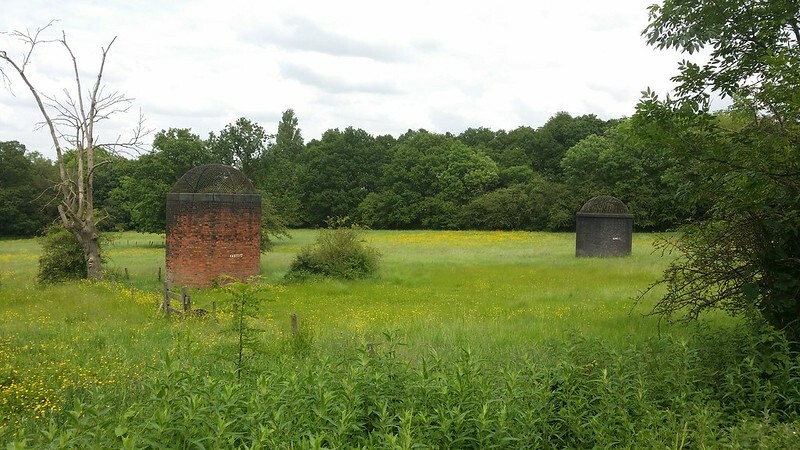 The A411 brought only traffic and the feeling of people looking at me, being broken only by the opportunity to look at these ventilation shafts above the Elstree tunnel. Wearying, I decided not to continue further and when the Loop turned left, I took the right to the station and called it a day.